Ask Tractor Transport to ship your baler anywhere in the US, Canada or Mexico. Transport your baler with a company you can trust - we’ll even ship your hay! Call the transportation specialists at Tractor Transport today, (877) 373-0109. 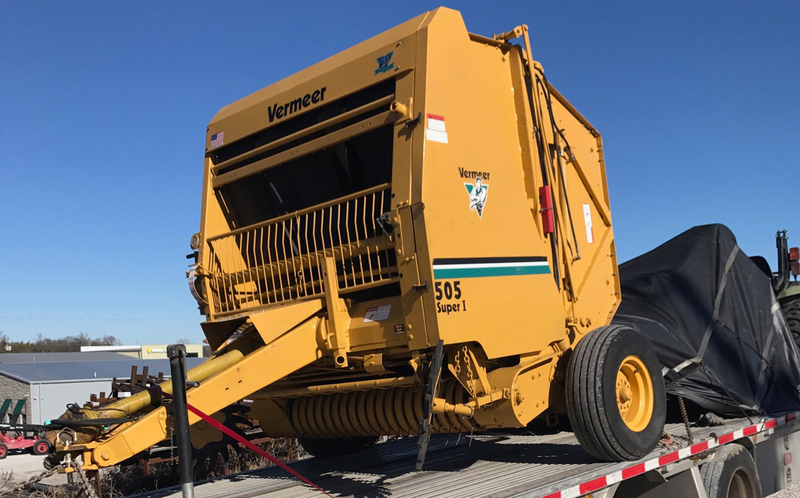 Tractor Transport recently shipped this Vermeer 505 Super I Round Baler from Paynesville, Minnesota, to Georgetown, New York. The trip was more than 1,200 miles long. Weight: 6,000 pounds. Length: 12 feet 5 inches. Width: 8 feet 2 inches. Height: 8 feet 2 inches. To ship your round baler anywhere in the US, Canada or Mexico, call Mike at Tractor Transport directly at (954) 603-2324. 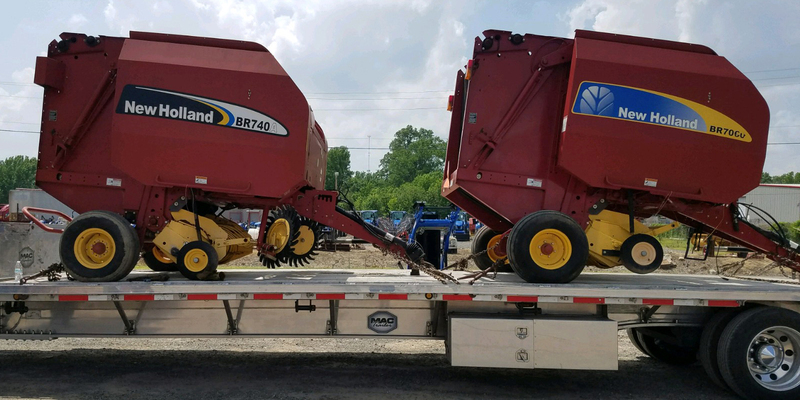 Tractor Transport recently transported these New Holland BR740A and BR70CU Balers from East Bernard, Texas, to Fargo, North Dakota. The trip north was about 1,330 miles long. Weight: 7,000 pounds each. Length: 15 feet each. Width: 8 feet 5 inches each. Height: 10 feet each. To ship your New Holland farm equipment to its next destination, call Tye at Tractor Transport directly at (954) 839-8629. Tractor Transport recently hauled this John Deere 469 Premium Round Baler from Sauk Rapids, Minnesota, to Pickton, Texas. The trip, which include a Chandler 20CLPT Spreader, was nearly 1,100 miles long. Baler - Weight: 5,800 pounds. Length: 12 feet 1 inch. Width: 8 feet. Height: 9 feet 1 inch. Spreader - Weight: 5,000 pounds. Length: 29 feet. Width: 8 feet 9 inches. Height: 8 feet 3 inches. To ship your John Deere baler anywhere in the US, Canada or Mexico, call Tye at Tractor Transport directly at (954) 839-8629. Balers can weigh from under 1,000 pounds to more than 10,000 pounds. Hay bales processed by commercial farm balers come in four sizes: small round, small square, large round and large square. Small balers create bales that are around 60 pounds. Large balers produce bales that can weigh more than 1,000 pounds. Round bales are more water resistant than square bales, as rain can run off the rounded sides. But square bales are easier to handle and stack in the barn. Choose Tractor Transport to ship your farm baler. Large balers might have to travel as an oversize load. Even if your baler falls within the width limits on your travel path, height could be a problem. 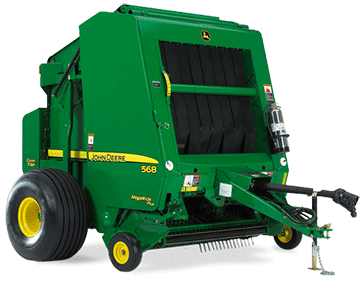 Balers more than 8 ½ -feet tall should be shipped on a step-deck trailer or RGN. Call your Tractor Transport representative for more details! Use your tractor to back smaller balers onto the trailer. If you don’t have ramps or an RGN, employ a forklift to lift the baler onto the trailer. Large balers might require a crane to hoist them aboard. Of course, access to a loading dock could simplify your loading process.